For starters, the Z2 is waterproof and can withstand being submerged in water for more than 30 minutes, making it a perfect beach buddy. 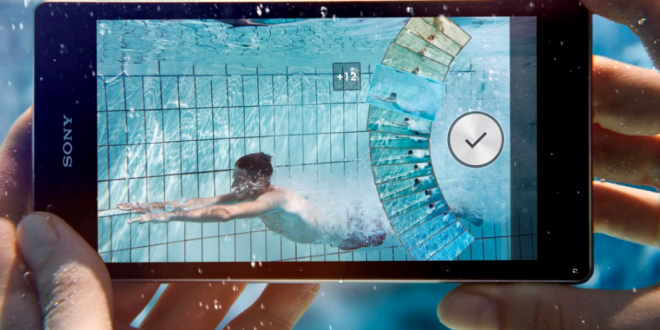 It also has a dedicated camera button that should help with taking pictures and videos underwater. Speaking of cameras, the Sony Xperia Z2 has an incredible snap app. The 20.7 megapixels are backed up by a large sensor, that you would normally find on a compact camera. It means photos and videos will have an exceptionally vivid and polished level of detail. It is one of the best cameras we have ever seen on a smartphone. The 5 inch FULL HD screen is crisp and clear, although viewing angles could be a little better. It’s not the best out there, that’s certain, but the screen shouldn’t be cause for complaints either. The Z2’s predecessor had some design flaws, and while it was certainly good looking, it was pretty hard to handle and hold for extended periods of time. The Sony Xperia Z2 has improved these aspects significantly, and the softly curved aluminium body feels polished and well-built. It’s still a big phone though, much bigger than the Samsung Galaxy S 4 or the HTC One in any case. If you think those are already over the top, you should look elsewhere. If you are not concerned by the size of your phone, and like the idea of a rugged, well designed and fast smartphone, the Xperia Z2 makes a great choice and remains one of the best phones on the market.